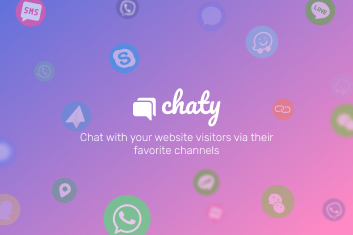 Chat with your website visitors via their favorite channels with Chaty. Show a chat button on the bottom of your site and communicate with your customers. WHAT DO YOU GET IN THE PRO PLAN? WHAT DO YOU GET IN THE FREE PLAN? 1. Show up to 2 different click to chat channels. 5. 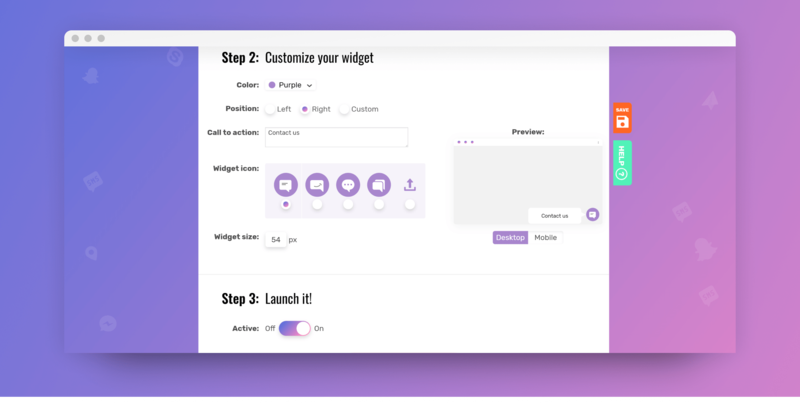 You decide if you want to show the widget on mobile & desktop, or both! 6. Show different channels for mobile and desktop. E.g. 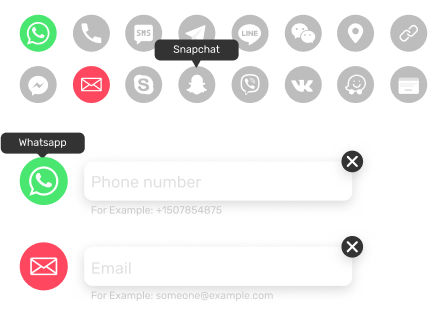 On mobile you can display a call now button, Viber button, and a Telegram button, and on desktop you can display a WhatsApp button and a Facebook Messenger chat button. Can I use Chaty on more than 1 domain? 2. You can buy the Pro plan that includes licenses for 5 domains, or the Agency plan that includes licenses for 20 domains. How long is my paid Chaty license valid for? Once you purchase any paid plan of Chaty, you can use it forever. Support and updates are available for 1 year. You can renew your license each year to get another year of support and updates. Will I be charged a renewal fee automatically after my license expires? No. You will only be charged if you renew your license manually. You will get a reminder email before your renewal date. Will Chaty stop working if I don’t renew my license? Your Chaty plugin and all your settings will continue to work as before; however, you will no longer receive plugin updates including feature additions, improvements, and support. If you are not satisfied with the plugin or it doesn’t work for you for any reason, you can email us at [email protected] within 30 days after your purchase and you will get a refund. How do I choose the communication channels I want to display on my site? You can choose up to two channels (unlimited in the pro plan), display the widget on mobile and desktop, choose from 6 available colors (unlimited in the paid plans), position the widget on the left or right (custom positioning in the paid plans), custom call-to-action, and a Chaty credit (can be removed in the paid plans). How can I remove the “Get widget” credit? 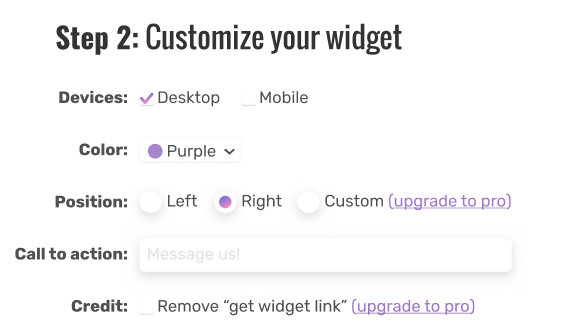 The “Get widget” credit will be removed automatically if you upgrade to any paid plan. Can I change the location and the color of the widget? I don’t see the widget on my site, what should I do? Please make sure you’ve chosen at least one channel and clicked on the “SAVE CHANGES” button. If your site has a cache plugin, delete cache as well. Does Chaty work on mobile? How do I activate my Pro plugin?